Four high school hockey players were presented the 2019 Herb Brooks Award at the Girls’ and Boys’ Minnesota State High School Hockey Tournament on February 23 and March 9. 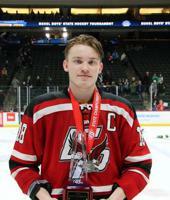 The Herb Brooks award is given annually since 2004 to the most qualified hockey player in the Minnesota state tournament who strongly represents the values, characteristics, and traits that defined Herb Brooks -- a passion for hockey, a willingness to sacrifice for the team, integrity and work ethic, and leadership qualities. This prestigious award commemorates the enduring influence Herb Brooks had on the sport of hockey in Minnesota and throughout the world. The Herb Brooks Award is supported by the Herb Brooks family, the Minnesota State High School League, the Herb Brooks Foundation, and the boys and girls high school hockey coaches associations. The award is presented on-ice at the Xcel Energy Center on live television on KSTC Channel 45 immediately after the Class 1A and 2A championship games for both boys and girls. Members of the Brooks family present the awards each year. This year the awards were presented by Herb Brooks’ daughter Kelly Brooks Paradise, son Dan Brooks, and granddaughter Olivia Paradise. On the ice, Donte makes sure his teammates give their best effort, but holds himself to an even higher standard. Donte’s coaches give his commitment to his family, team and community as a huge reason for Greenway’s big turnaround this season that resulted in a run to the state tournament title game. Off the ice, Donte volunteers at the United Way and the Salvation Army. 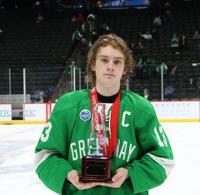 One of the major selection points for the Herb Brooks Award is a true love and passion for hockey. Jack Jensen displays that characteristic in spades. Jack plays, coaches and watches hockey constantly, even playing roller hockey to help hone his skills. His passion and dreams of hockey involve hoping to play in the NHL. As a two-year team captain, Jack sought ways to challenge both himself and his teammates to perform at a higher level. He tackled the F45 program (an off-ice fitness and conditioning program) and brought along many of his teammates. 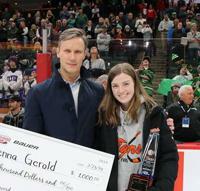 Jenna’s story is unique among this year’s Herb Brooks Award winners. After suffering a torn ACL playing soccer last June, Jenna missed the remainder of her soccer season, and the prognosis of her playing hockey this season was dim. But as team captain for both sports, Jenna attended every practice film session and weight training session, mentoring her teammates and supporting them from the bench. Jenna was finally cleared to play hockey with full contact the very last day of the regular season, and she came back in the most inspirational and positive way possible. In the four games she played before the state tournament she tallied four goals and five assists. 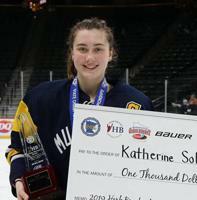 As the team captain Katherine set a standard of integrity and loyalty to her team. Without hesitation, she says she expects 100 percent from herself, her coaches and her team. As the team captain, she committed herself to being a role model and a vocal leader, and has created a trusting and highly accountable relationship with her team mates and coaches. ©2019 Herb Brooks Foundation / SportsEngine. All Rights Reserved.